This book is provided "as-is" and expresses the author's views and opinions. The views, opinions and information expressed in this book, including URL and other Internet website references, may change without notice. Microsoft and the trademarks listed at https://www.microsoft.com on the "Trademarks" webpage are trademarks of the Microsoft group of companies. Jeremy Likness, Sr. Cloud Developer Advocate, APEX, Microsoft Corp.
Cecil Phillip, Cloud Developer Advocate II, APEX, Microsoft Corp.
Bill Wagner, Senior Content Developer, APEX, Microsoft Corp.
Maira Wenzel, Senior Content Developer, APEX, Microsoft Corp.
Steve Smith, Owner, Ardalis Services. What are the pros and cons of serverless? Why should you consider serverless for your own applications? How can you build, test, deploy, and maintain your serverless code? Where does it make sense to migrate code to serverless in existing applications, and what is the best way to accomplish this transformation? This guide focuses on cloud native development of applications that use serverless. The book highlights the benefits and exposes the potential drawbacks of developing serverless apps and provides a survey of serverless architectures. Many examples of how serverless can be used are illustrated along with various serverless design patterns. 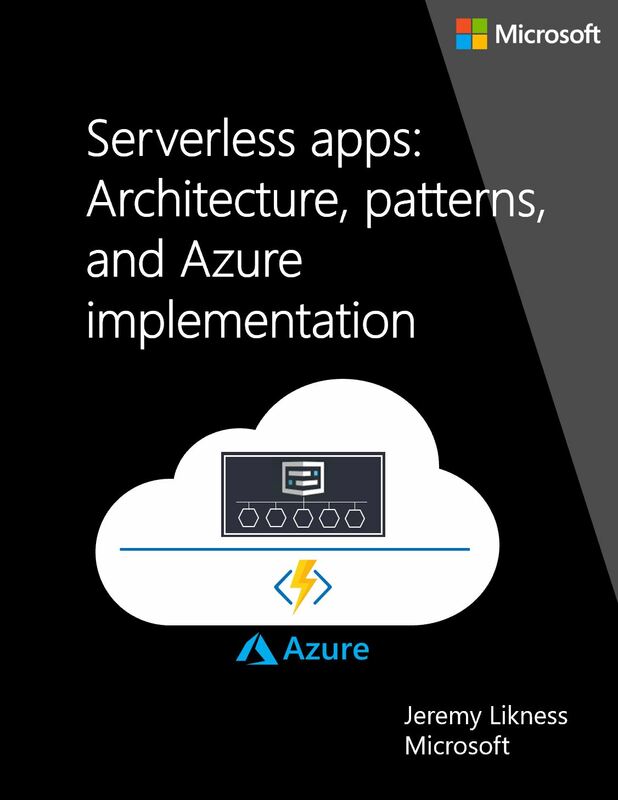 This guide explains the components of the Azure serverless platform and focuses specifically on implementation of serverless using Azure Functions. You'll learn about triggers and bindings as well as how to implement serverless apps that rely on state using durable functions. Finally, business examples and case studies will help provide context and a frame of reference to determine whether serverless is the right approach for your projects. Serverless is the culmination of several iterations of cloud platforms. The evolution began with physical metal in the data center and progressed through Infrastructure as a Service (IaaS) and Platform as a Service (PaaS). What hardware should be installed? How is physical access to the machine secured? Does the data center require an Uninterruptible Power Supply (UPS)? Where are storage backups sent? Should there be redundant power? The list goes on and the overhead was enormous. In many situations, IT departments were forced to deal with incredible waste. The waste was due to over-allocation of servers as backup machines for disaster recovery and standby servers to enable scale-out. Fortunately, the introduction of virtualization technology (like Hyper-V) with Virtual Machines (VMs) gave rise to Infrastructure as a Service (IaaS). Virtualized infrastructure allowed operations to set up a standard set of servers as the backbone, leading to a flexible environment capable of provisioning unique servers "on demand." More important, virtualization set the stage for using the cloud to provide virtual machines "as a service." Companies could easily get out of the business of worrying about redundant power or physical machines. Instead, they focused on the virtual environment. Patching and backing up servers. Keeping the operating system up-to-date. What size services are needed? How do the services scale out (add more servers or nodes)? How do the services scale up (increase the capacity of hosting servers or nodes)? With serverless, infrastructure is abstracted. In some cases, the developer no longer worries about the host at all. Whether or not an instance of IIS, Kestrel, Apache, or some other web server is running to manage web requests, the developer focuses on an HTTP trigger. The trigger provides the standard, cross-platform payload for the request. The payload not only simplifies the development process, but facilitates testing and in some cases, makes the code easily portable across platforms. Another feature of serverless is micro-billing. It's common for web applications to host Web API endpoints. In traditional bare metal, IaaS and even PaaS implementations, the resources to host the APIs are paid for continuously. That means you pay to host the endpoints even when they aren't being accessed. Often you'll find one API is called more than others, so the entire system is scaled based on supporting the popular endpoints. Serverless enables you to scale each endpoint independently and pay for usage, so no costs are incurred when the APIs aren't being called. Migration may in many circumstances dramatically reduce the ongoing cost to support the endpoints. This guide specifically emphasizes architecture approaches and design patterns and isn't a deep dive into the implementation details of Azure Functions, Logic Apps, or other serverless platforms. This guide doesn't cover, for example, advanced workflows with Logic Apps or features of Azure Functions such as configuring Cross-Origin Resource Sharing (CORS), applying custom domains, or uploading SSL certificates. These details are available through the online Azure Functions documentation. The first part of this guide examines why serverless is a viable option by comparing several different architecture approaches. It examines both the technology and development lifecycle, because all aspects of software development are impacted by architecture decisions. The guide then examines use cases and design patterns and includes reference implementations using Azure Functions. Each section contains additional resources to learn more about a particular area. The guide concludes with resources for walkthroughs and hands-on exploration of serverless implementation. The guide and related samples are constantly evolving, so your feedback is welcomed! If you have comments about how this guide can be improved, use the feedback section at the bottom of any page built on GitHub issues.